MONTREAL - A man with the same name as the gunman slain in Wednesday's shooting in Ottawa had an extensive criminal record for petty crimes in Quebec as well as a single prior in Vancouver from three years ago. Highly placed law enforcement officials have identified the shooter as Michael Zehaf Bibeau, born in 1982. According to Quebec court records, a man with that name would have turned 32 last week, on Oct. 16, putting his year of birth as 1982. A search of the publicly available Quebec court records database suggests he had a lengthy criminal record with several convictions and brushes with the law in the early and mid-2000s. The records appear under three different names — Michael Bibeau, Michael Zehaf Bibeau and Michael Bibeau Zehaf. The earliest of the 13 identified Quebec court records dates back to June 2001 in Montreal. The last time his name appears in the provincial court database is for a charge in 2006, also in Montreal. For that marijuana-related count, he pleaded guilty in court in 2009 and received an absolute discharge. Twelve of the 13 cases resulted in convictions. Four of them are drug-related — three for possession of marijuana and one for PCP — with those charges dating back to 2004, '05 and '06. The longest sentence he received among the four was 60 days, on the 2004 PCP charge. A 2001 charge on impaired driving resulted in a fine and suspended licence a year later. In another case, he received a six-month sentence in 2003 and three years' probation on a weapons charge. There was also a prior conviction for assault causing bodily harm in 2001 for which he received a suspended sentence and a fine in 2002. His longest sentence was for robbery, possession of break-in tools, theft and conspiracy with a co-accused in 2003. He was sentenced to two years in jail and three years' probation in that case. Other convictions in his file are for breach of probation in 2003 and for twice breaching bail conditions in 2004. The records suggest a number of addresses for Bibeau since 2001 — a number in Montreal as well as one in Aylmer, Que. In some of the court documents, he's listed as having no fixed address. The charges against him were filed in three provincial districts: Montreal, Laval and Saint-Jerome. A man with the name Michael Joseph Paul Zehaf Bibeau, with the same year of birth, was charged in Vancouver in December 2011 with robbery. He pleaded guilty in February of the following year to the lesser charge of uttering threats, for which he was sentenced to one day in jail in addition to 66 days credit for time served. Court records indicate he was seen by a psychiatrist while in jail and found fit for trial. The Vancouver police and the B.C. 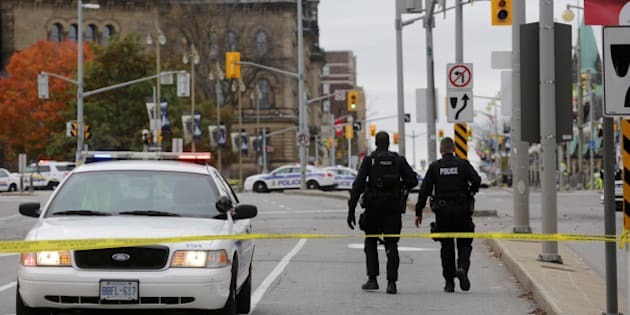 RCMP have confirmed they are working with the municipal police and Mounties in Ottawa, though they have declined to provide any more information. A spokesman for the Montreal police says he hasn't been informed about any formal requests to provide assistance in the investigation, but said he was aware reporters were camped out at a Montreal address. A source with knowledge of the case said that while the shooter had been denied a passport "in the normal course of applying," he was not under surveillance by security officials.